Alpha, Beta & Omega Puppy Coach members receive a code for a free 5kgs trial of Natural Instinct's product, delivered direct to your door with no obligation to buy. My dog advice always aims to keep things as natural, balanced and straight forward for the dog as possible and nutrition is no diffferent. With this in mind I choose to promote a raw diet as best practice for canine nutrition. However, my journey to be comfortable with this evolved in line with its evolution into the pet food industry. It wasn't always as straight forward to source a balanced raw food diet as it is now. My first experience of raw feeding wasn't particularly positive, when the very first Barf (Biologically Appropriate Raw Food) diets became trendy. This was during my early Veterinary Nursing days and sadly I was privy to this sudden change in dog nutrition creating costly consequences. Dog owners were encouraged to prepare their own raw foods, leading to a lack of complete nutrition as dogs are omnivores and require vegetation as well as meat proteins. They were also exposed to meats that were high risk for salmonella and campylobacter bacteria, resulting in serious gastro-intestinal upsets in both dogs and owners. Many dogs had problems as a result of being fed dry or cooked meat diets for most of their lives, then having to tolerate a change to a raw diet inclusive of bone. In many cases the pH (gastric acidity) of the stomach had become more alkaline and so it was not in a position to cope with the digestion of bone effectively. There was also an increase in the number of foreign body operations that were performed due to dogs swallowing bones as they had not been used to chewing their food efficiently. The early part of digestion begins in the mouth via chewing (mastication) without this process being in place it was impossible for the stomach to cope with the digestion of solid bone. I lost count of how many unnecessary operations had to be performed as owners had just chosen to suddenly start feeding raw chicken wings, or even worse fed them cooked because they had read somewhere dogs were actually able to consume chicken wings. In principle there is nothing wrong with the home prepared Barf Diet if an individual has a solid understanding of where and how to source the ingredients. It is obviously the most natural form of feeding for the dog and ensures the absence of processing procedures and artificial colours and flavourings, so it makes sense to try and acheive best practice where possible. It is also excellent for managing allergies which are all too common in many dog breeds today. The down side for home preparation is that it is time consuming, requires a huge amount of health and safety awareness and can be expensive, plus there is always a risk that it may not be completely nutritionally balanced for the dog. However, recognition of the benefits of raw feeding via the original 'BARF' diets has been the springboard for a new wave of canine nutrition experts to enter the dog food market and this is most welcomed. Being able to rely on one particular brand for a balanced, safely delivered raw meat based diet is invaluable. 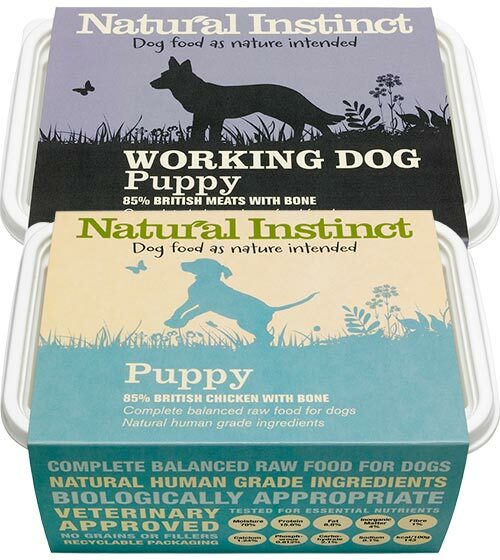 After trying many different brands and even giving up on raw food for a while as I found some brands sloppy and the food was unappealing to my dogs, I have finally found the very best raw food product on the market in my opinion - Natural Instinct. I had my concerns in how I would deliver the food at home to begin with, having two small children, and two big dogs requiring a fair amount of feeding and management. This was short lived once I conducted a satisfactory level of research and put a feeding regime into practice. I did find some negativity during my question asking period. I was told by some professionals that salmonella may be emitted through my dogs skin and therefore could pose a risk, young puppies may not cope with the digestion and a variety of other negative comments. Whether there is any truth in either of these statements remains for me to see, all I can say is that I have not come across any such case on my travels in the dog world nor have I been affected after now several years of feeding this way. As with everything I do with my dogs, I formed my own opinion based on everything I had read, been told and observed and I applied a practical approach to my dogs feeding regime once I had decided to stick with raw. This focused mainly on how I handled and delivered the food. My dogs are fed outside, I prepare the food in my converted garage and I have a freezer specifically for their food, avoiding any cross contamination in my kitchen. That said I still handle the raw food as if it were a raw chicken breast, paying attention to my own personal hygiene, what instruments I use and making sure the bowls are picked up and put in the dishwasher once the dogs are finished. Really it is no more difficult or time consuming than any other form of feeding as you should still pay attention to hygiene even when feeding dry foods. I have many clients who do not have the ability to feed outside or have a separate space and they manage just as efficently in their routines. The food is easy to order, delivered within 24 hrs to my door, comes well packaged so won't defrost if Im not home straight away, and stores well in plastic tubs. I find it hugely cost effective to feed two 35kg dogs, they love it, they look great and best of all the faecal waste is solid and minimal! Finally, I cannot recommend enough the benefits of providing my dogs with a good old frozen raw knuckle bone or something similar. For me this has been an invaluable means of helping Hogan cope with teething and the influx of testosterone, plus his adult teeth are as pearly white as they were when they orignally came through. Nothing is a better teeth cleaner than raw bone in my opinion. As I said, my raw food product of choice is Natural Instinct and I whole heartedly recommend both their food and product support. They are always happy to answer questions and their staff have a wealth of nutritional knowledge which, along with their genuine love of dogs and respect for their clients makes them a leading manufacturer of raw food diets.